Your Online Content Marketing Partner! A quality source for content marketing is a must for online marketing. Content Creativity is your ultimate end of the quest for that. Easy Way to Post Free Blog to Boost your Marketing! Posting blogs on a high Domain Authority and Page Rank is a daunting task. If you are also hunting for free blog website then your quest is over here. Just register on Content Creativity and post endless blogs to get high-quality backlinks. Here is how you can do it. You read it right, we do not charge a single penny to get registered or sign up on our website. Just log on to Content Creativity, fill up the registration form and you are good to go! You may be asked to verify your email after registration. After that, you can access your account from anywhere and anytime. Just visit our website, enter your login credentials and there you are! A search bar improves the efficiency of the website navigation. We made it easy for you search a blog on the website through search bar option. Just type a keyword and hit the enter button. Here comes your desired blogs. Once you have signed up and logged in, you are all set to get started with your first blog posting. Just click on Add Blog, enter blog details e.g. title, blog contents, and SEO contents and hit the submit button. Bam! Your first blog is posted. Post your blog and avail unlimited perks to get your content boosted online. 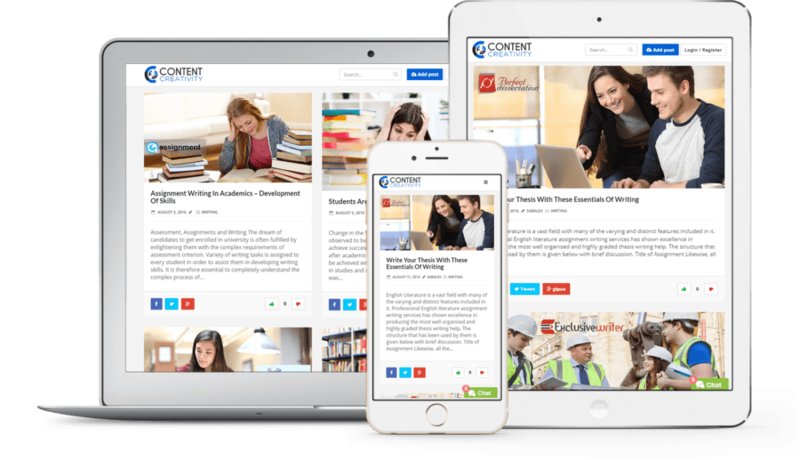 We charge you a quite reasonable amount for writing content for your website and business, which in turn will bring you more traffic. You can request us to write your marketing content. Just click on request a content and we will write business/marketing content. Get stuck while signing up, logging in or posting a blog? Don’t worry! We are just around the corner. Click on live chat and talk to our expert. A simple dashboard to show you your recent activities, your blogs, your profile and so on. Now, you do not need to wander around to see activity. Unlike other blogging website, we don’t bind you to upload one or a few media files for your blog. In fact, you can upload as many as you want. No matter what industry you belong to, we have a huge list of categories to match your needs. You can use tags for blogs to boost your blog in search. Want to know if your readers like your blog or not? We have like and dislike button. Just keep an eye on readers’ comments. Social media plug-ins are given so that you can share your blog on a number of social media just with a few clicks. 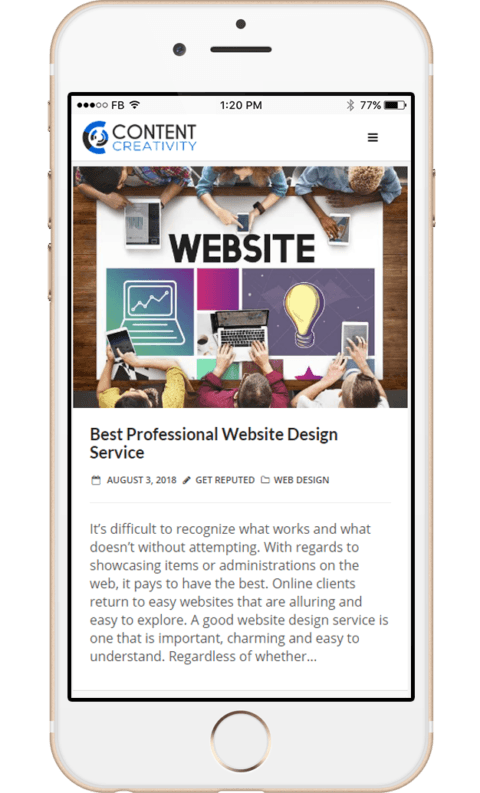 Now access Content Creativity on your smartphone or android phone. Perfectly Fit on your Desktop Screen! Content Creativity is made to perfectly fit to your all devices including desktop, iPad and tablet screen. So, whether you are home or in office, posting blog has been made hassle-free for you.